The Road to the Horizon: Rumble: Gorbachev and Louis Vuitton. The end of communism as we knew it. Or not? 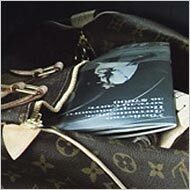 Rumble: Gorbachev and Louis Vuitton. The end of communism as we knew it. Or not? Apparently this ad has been around for a while, but I only noticed it yesterday, spread over two pages of the Alitalia inflight magazine: Former Soviet leader and USSR president Mikhail Gorbachev now makes publicity the French luxury label, Louis Vuitton. 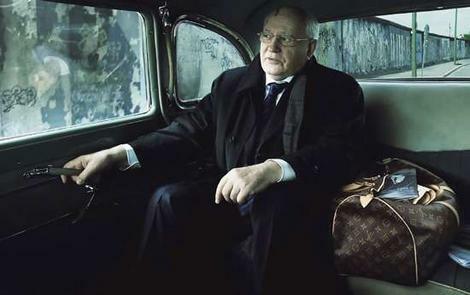 The ad shows Gorbachev in a car with a Vuitton bag at his side. The picture is rather dark, suggesting the gloomy ages of the Cold War and Communism. Gorbachev looks through the window at the Berlin Wall, depicted in the background. Poking out of the bag is a publication with the headline (in Cyrillic): "The Murder of Litvinenko: They Wanted to Give Up the Suspect for $7,000. ", referring to Alexander V. Litvinenko, the former KGB spy who died last November after being poisoned with a radioactive isotope. On his deathbed, Litvinenko accused Russia's President Vladimir Putin of orchestrating his murder. The British authorities accused one of Litvinenko’s associates, Andrei Lugovoi, of the crime and requested his extradition from Russia. The Kremlin refused. Everyone in Central Asia and the Caucuses who has any power what-so-ever, is an ex-KGB member (they are everywhere - even in international corporate environs). Live there and you will realize that, yes, not much has changed. Like they say "you can put lipstick on a pig, but it's still a pig."